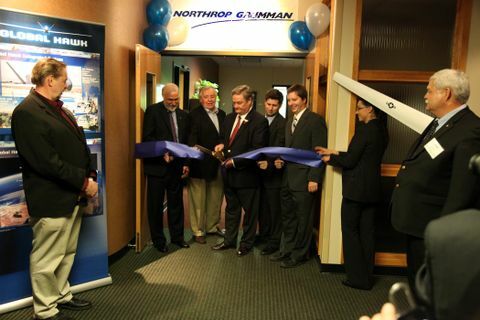 GRAND FORKS, N.D., May 24, 2010 -- Northrop Grumman Corporation (NYSE:NOC) opened an office here in a ceremony on May 21 to provide support for the RQ-4 Global Hawk unmanned aircraft systems (UAS) being assigned to Grand Forks Air Force Base. The office could eventually employ more than 100 people and attract suppliers and subcontractors as the number of aircraft increase at the base. North Dakota's Congressional delegation commented on the importance of Northrop Grumman's decision. "As we heard at the UAS Summit, it's clear the Global Hawk UAS will remain a key cog in our national defense. Northrop Grumman and the people of Grand Forks will be vital partners in supporting these aircraft," said U.S. Senator Kent Conrad (D - N.D.). "I believe Northrop Grumman's investment in North Dakota represents the beginning of a long and successful business relationship with both the Air Force Base and the university in Grand Forks." "This is another exciting addition to the high-tech hub of UAS activity we've worked to create in the Red River Valley Research Corridor," said U.S. Senator Byron Dorgan (D - N.D.). "Northrop Grumman is a world-class company with top-notch products that are distributed around the globe. Its presence here further demonstrates that this area is becoming a first-class UAS center in the U.S."
"The Red River Valley is very quickly becoming a center of UAS research and activity. We have a growing UAS mission, the world's best aviation school, and a community that is interested in supporting this industry. Northrop Grumman's decision to bring an office to Grand Forks is a big boost for the local economy, but I believe it will also pay off for the company and for our country," said U.S. Representative Earl Pomeroy (D - N.D.). At the opening ceremony, George Guerra, Northrop Grumman vice president for High Altitude â Long Endurance (HALE) Systems, presented a $25,000 grant in the form of a large facsimile check to the University of North Dakota for the John D. Odegard School of Aerospace Sciences recognizing its advances in the area of unmanned systems research. The University of North Dakota is the first school to offer a Bachelor of Science degree in Unmanned Aircraft Systems Operations. "We are committed to being part of the Grand Forks community," Guerra said. "Northrop Grumman is serious about supporting our customers wherever our products are based and this office will be the foundation of that commitment to Grand Forks Air Force Base, the local community and the State of North Dakota." Capable of flying at altitudes up to 60,000 feet for more than 32 hours at a time at speeds approaching 340 knots, Global Hawk can be equipped with a variety of visual and electronic sensors and communication relays. Global Hawk has been flying more than 12 years, including operations in national airspace in the U.S. and other countries. It is still the only UAS to receive both a U.S. Air Force airworthiness certificate and a Federal Aviation Administration certificate of authority, allowing routine operation in civil airspace.